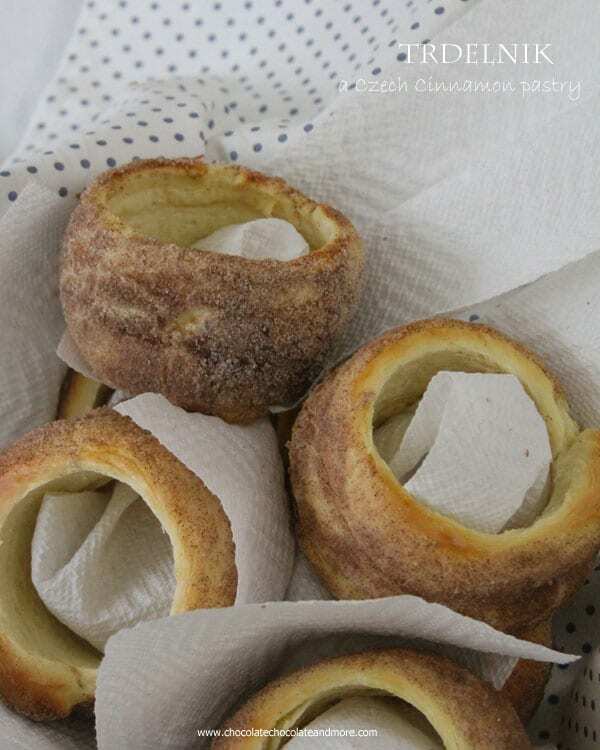 Czech Cinnamon Pastry-Trdelnik - Chocolate Chocolate and More! 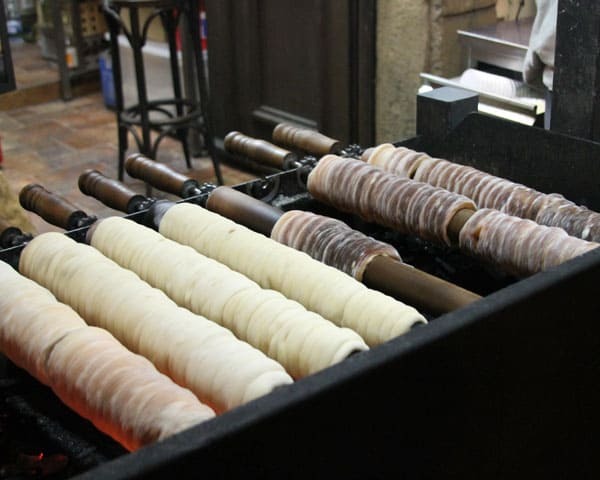 This Czech Cinnamon Pastry-Trdelnik is sold by street vendors all over Prague, A yeast dough, wrapped around a cylinder, rolled in cinnamon sugar and then baked over an open flame. I have to share with you all my amazing trip I just returned from. I had the opportunity to join my sister and niece in Prague, Salzburg and Munich right after Christmas. I wish I could have fit more time in each city as Europe is filled with so much history and great food. 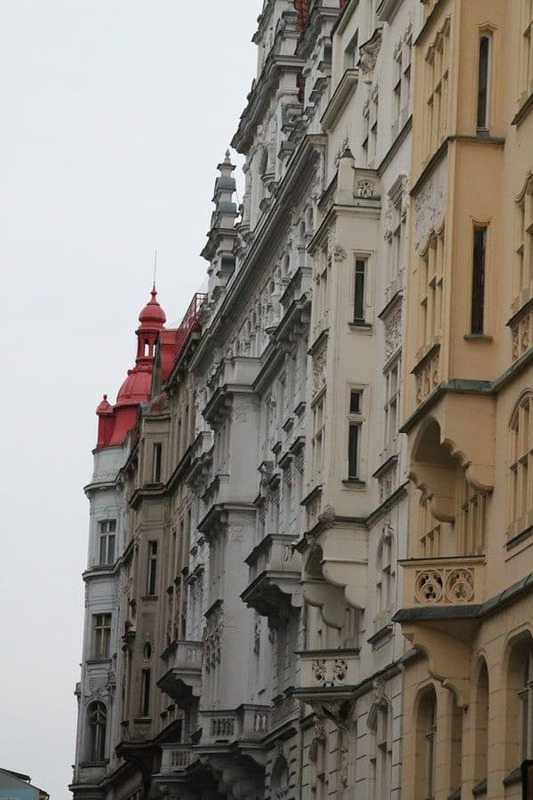 I’ve shared photos from Prague below the recipe for those who are interested. One of the best things about Prague (aside from the architecture, the castle, the old world feel) is the street vendors and street vendor food. We probably passed 10 booths making Trdelnik before we stopped to purchase one. The wonderful smell of cinnamon tempting us as we wandered through town. Usually cooked over coals or a low gas fire, the pastry is wound around dowels and rotates continuously while cooking to perfection. Since I have no desire to bake outside in the winter, and I don’t have one of these ovens made specifically for this pastry, I did some research. First, I had to find a recipe. Every recipe I found was for making these, of course, over the special oven/grill. I finally found a recipe (actually a youtube video) that made them in the oven. Success! The only problem-it was in Czech. I didn’t understand a single word. Even the graphic listing the ingredients was in Czech. This wasn’t going to stop me. I spent 4 hours looking up words, trying to understand the language, just to translate the basic recipe. And I realized my measurements were completely off. So after 4 batches of the dough, I finally got it right. Exactly what I had seen and tasted in Prague. Wrapping the jars takes a little more effort than most pastries but you want the heat to circulate around the entire pastry. And it’s worth it. I almost felt like I was back walking the streets in Prague, except I was warm in my kitchen. In mixing bowl, combine flour, sugar, 2 eggs, butter and proofed yeast mixture. Start mixing on low speed and add in remaining 1/4 cup warm milk. Once fully blended switch to dough hook or knead on counter by hand for about 5 minutes. Until smooth. Let dough rise in bowl for 30 minutes, in a warm location, covered with a damp cloth. While dough is rising, cover 8 half pint (8 ounce) jars with aluminum foil, set aside. Make an egg wash by combine egg and 1 teaspoon of water, whisking until well combined. Combine sugar and cinnamon to make cinnamon sugar. Once dough is risen, turn out onto counter, roll into a thick log and divide into 8 equal pieces. Roll each piece into a long rope, about 2 to 2 1/2 feet long. 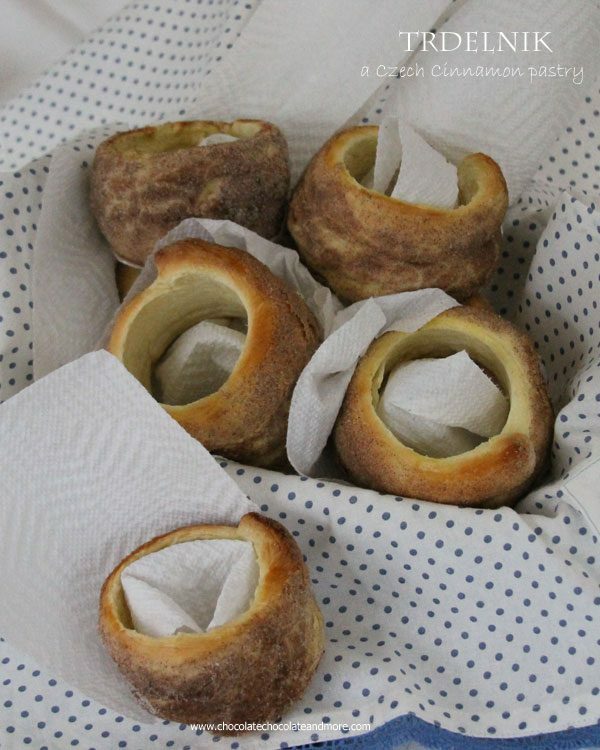 Rub each foil covered jar with cold butter then wrap 1 rope of dough around each jar. Dough should go around the jar almost 3 times. Spread cinnamon sugar out on a baking tray or 9x13 pan (something big enough to roll your pastry covered jar in). Brush pastry with egg wash and then roll pastry in cinnamon sugar to coat, pressing down as you roll. Place pastry covered jar on a parchment covered or lightly greased baking sheet, open end down. Make sure to space jars 2-3 inches apart. Bake in a preheated 400 degree oven for about 15 minutes. Remove from oven and carefully slide warm pastry off jars. Instead of jars, you can also use small tin cans as molds. Sadly, we arrived too late to tour the Prague Castle but if I ever get back there, it will be first on my list. 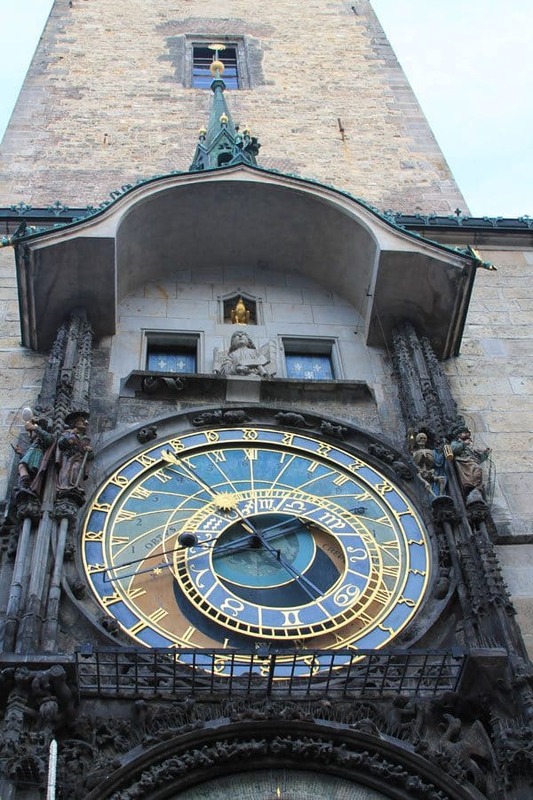 Prague is famous for it’s Astronomical Clock. Installed in 1410, it is the oldest, still working clock of it’s kind. 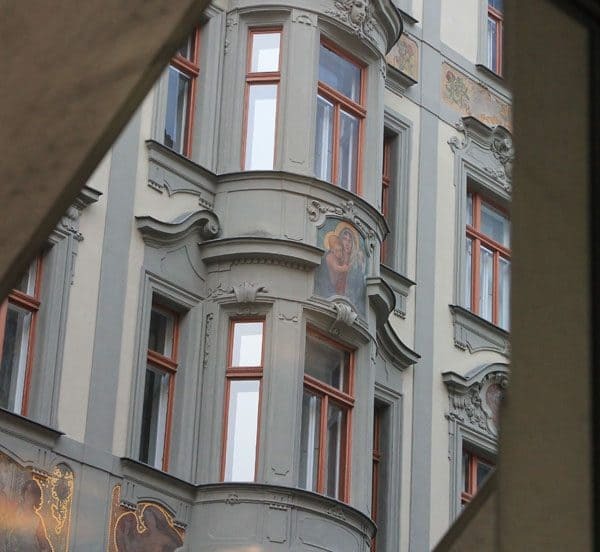 We stayed in the heart of Prague. My sister booked us a room in an apartment using Airbnb. Think vacation rentals by owner on a smaller scale. And in Europe as well as the US. This was the one we rented. Vincent, our host, provided a nice clean apartment, had great information of sites to see, places to eat, and also a notebook with tips from other visitors. Goodness gracious those look good, and those buildings are gorgeous. Your pictures are stunning, what a great trip! These pastries look delicious! Thanks Amanda, the trip was amazing, and so was all the food! I can not wait to try making these! They were selling them at one of our malls a couple years ago. We loved them. I’ve never been to Prague but New Years in Salzburg in 2006. It was beautiful! Just like I dreamt since I was a little girl. This little girl was totally mesmerized with The Sound of Music. The music, the mountains and the beautiful Julie Andrews. My daughter and I took The Sound of Music tour. Loved, loved, loved it. We walked the streets of Salzburg. Had vienerschnitzel, Sacher torte, Apricot Brandy and freshly made huge pretzels. Not like the pretzels here in the states. They were filled with apples & cinniamon and chocolate. They tasted like donuts. And this is why I am writing. Did you have these? Oh how I would love to suprise my daughter and make them. I wish I had more time in each of the cities. It snowed in Salzburg the 2 days we were there. My post on Salzburg will be up Sat so I don’t want to give too much away but we did stick to mostly indoor sites. We spent New Years eve in Munich, completely crazy there! First: These look absolutely stunning! Third: You offer such absolutely wonderful photos and recipes on your web site! Fourth: It will be a pleasure to try these!!! YUM-in-waiting! Thanks Janine, I really do love playing in the kitchen and these were so good, I had to get them right! Everything about this post is wonderful! The photos are absolutely beautiful. I am so happy you had the opportunity to visit such a gorgeous place so rich in history. The recipe looks like a lot of hassle to me, but I will probably try it because it looks so good. 😉 I would like to know how to properly pronounce Trdelnik, if you happen to know. Keep up the good work and thanks for all you do! omigosh how fun!!! 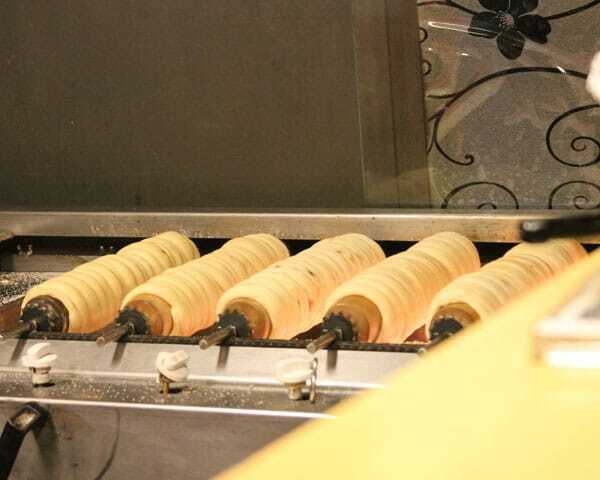 And Trdelnik is so cool-it’s so interesting how its made–and omigosh YUM! I’d eat like 10 of em. I’m glad you went to all that trouble to create this recipe because they look absolutely amazing! Thanks Katie, not as good as the actual ones made in Prague but really close! Made these tonight and my family loved them!!! We had them in Prague at the Christmas markets two years ago as well! I was so excited to try your recipe! Thank you! I’m so glad you enjoyed them! I can’t wait to get back there again! 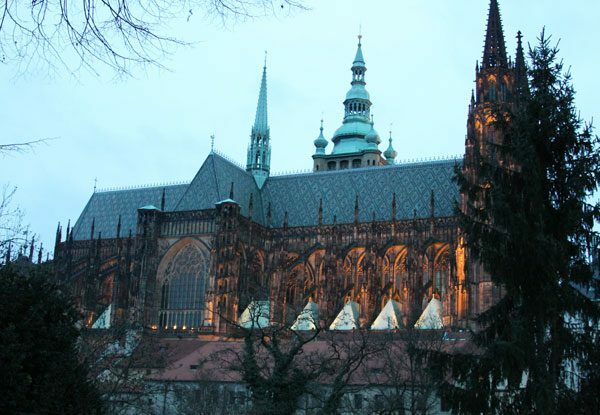 Joan what a wonderful opportunity and Prague looks breathtaking; not to mention this recipe. Thanks for sharing your experience! Thanks Carrie, I can’t wait to go back when it’s warmer! What a fun trip! I like being able to remember fun trips through food! 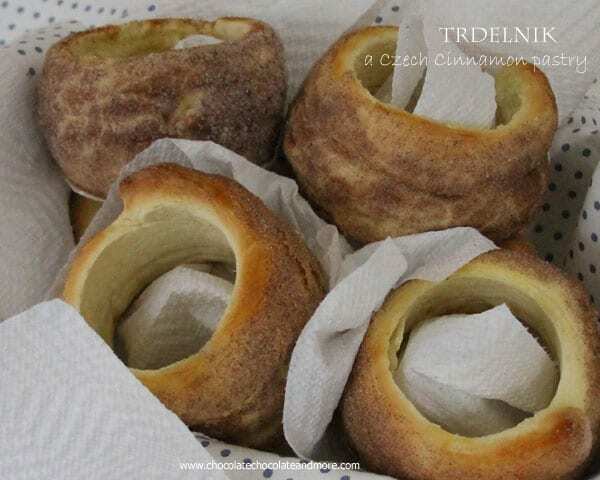 Did you know that Cezch trdelnik is originated in Slovakia? 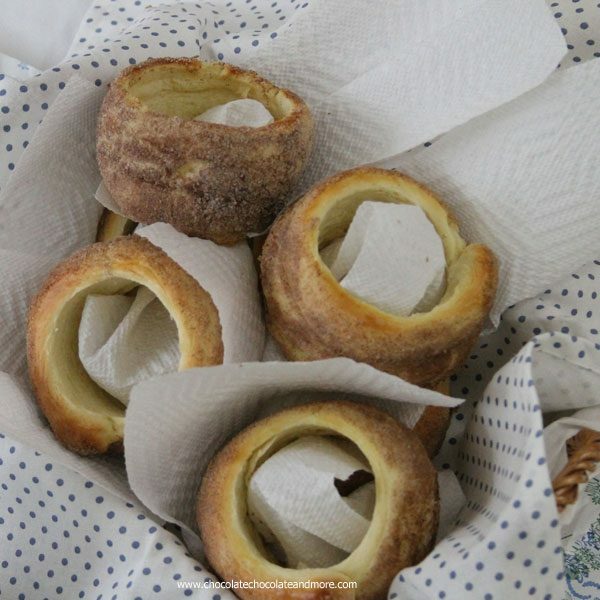 It calls Skalicky trdelnik. Instead cinnamon they put nuts. Yes, As I was researching to recipe, I found the origin of this treat. Since I had the version with cinnamon, that’s what I tried to replicate. I’m sure it’s just as delicious with nuts. I was so excited to find your post of this recipe! My husband and I have been to Prague twice and loved snacking on this yummy treat as we walked around Old Town. I just tried the recipe and surprised my husband when he came home from work! So yummy and very close to the real thing! Thank you so much for tracking down the recipe, translating to English and sharing! 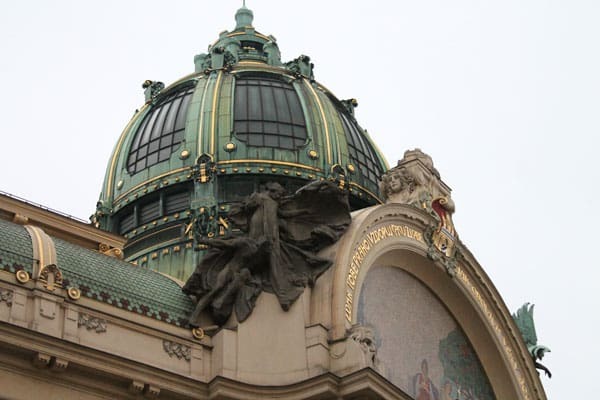 My husband and I are returning to Prague next year and taking our teenage daughters with us. We can’t wait to show our girls all the things we love about Prague and now we don’t have to wait to share one of our favorite Prague snacks with them! Thanks for sharing!!! 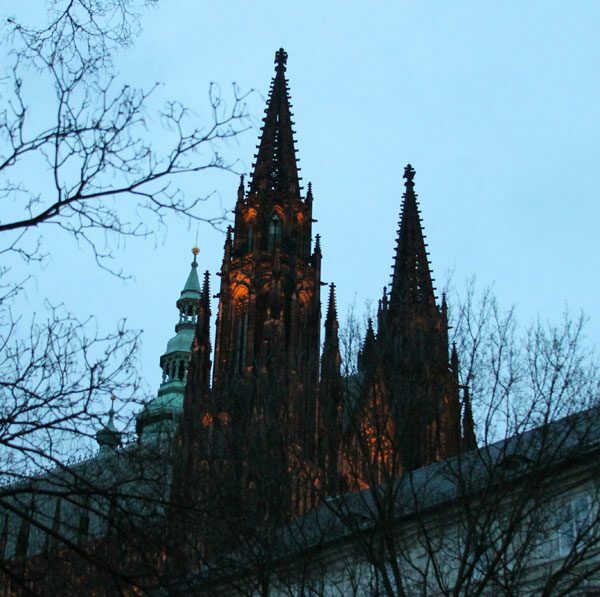 Prague is amazing, one of my favorite cities. I know your girls will love it! Just got back from Prague and these were our favorite treat! However, we paid a bit extra to have their amazing chocolate smeared on the inside. Was to die for!